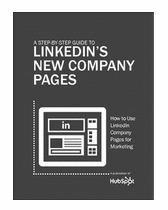 How to take advantage of LinkedIn’s company pages for marketing.On September 6th, 2012, LinkedIn announced huge changes to Company Page design and user experience, which completely changes the way we view the platform as a marketing tool. “For companies, this means a more powerful way to build relationships with your target audience on LinkedIn,” said Mike Grishaver from LinkedIn’s Product Management team. This all sounds great, doesn’t it? The question is: are you prepared to optimize your own Company Page once these changes roll out to you? Download the Step-by-Step Guide to LinkedIn’s New Company Pages to learn what’s changed and how you can leverage these updates to drive traffic and leads, grow reach, increase product awareness, and optimize for search.